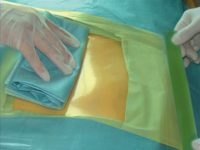 Yellow transparent PU film coated with hypoallergenic adhesive containing PVP-Iodine which reduces the risk of skin flora contamination throughout a surgical procedure. The dressing is equipped with frame delivery system for easy handling to prevent wrinkling of PU film during application. 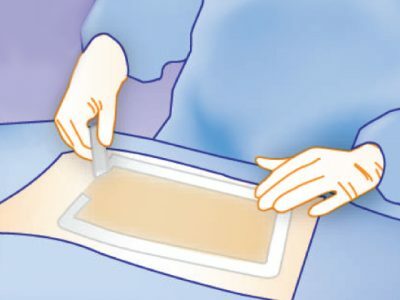 The breathable polyurethane film allows skin to breathe underneath, so it prevents accumulation of moisture under the film and detachment of the dressing. The polyurethane film is coated with hypoallergenic adhesive containing PVP-Iodine which has broad spectrum antimicrobial activity against gram positive and negative bacteria, MRSA, yeast and fungi. Moreover, the antimicrobial effect is sustained throughout long procedures. Antimicrobial effect is due to the presence of diatomic elemental form of iodine (free iodine). It is believed that iodine precipitates the proteins of microorganisms by forming salts via direct halogenation. Approximately 90% of iodine, absorbed by bacterial cells, reappears as iodide, thus confirming oxidative interaction as the major bactericidal mechanism of topical iodine. Transparent, conformable, elastic, bacteria proof, virus proof and waterproof film. Iodine provides broad spectrum antimicrobial activity against gram positive and gram negative bacteria, yeast and fungi. Suitable for all types of surgery: Orthopedic, Neurosurgery, Major abdominal, Plastic surgery, Open heart and thoracic, Ophthalmic and pediatric surgery. Do not use Incifilm® Iodine Frame Style on patients with known sensitivity to iodine.